Bazin (pronounced as "buh-zeen"), also referred to as bazeen (pronounced [baːˈziːn], is an unleavened bread in the cuisine of Libya prepared with barley, water and salt. Bazin is prepared by boiling barley flour in water and then beating it to create a dough using a magraf, which is a unique stick designed for this purpose. The dough may then be placed in a pan and allowed time to harden, after which it is baked or steamed. [lower-alpha 1] The salt contributes to the hardness of the bazin. Bazin may have a paste-like and hardened texture. [lower-alpha 2] It may also be prepared using whole wheat flour, olive oil and pepper as ingredients. When consumed, bazin may be "crumpled and eaten with the fingers." It is typically eaten using the right hand, and may be consumed communally. 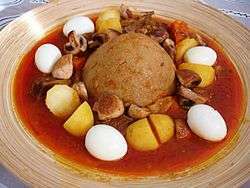 Bazin has been described as a traditional dish and as a national dish of Libya. Bazeen sauce may be prepared by frying mutton meat (preferably shoulder or leg) with chopped onions, turmeric, salt, chilli powder, helba (fenugreek), sweet paprika, black pepper and tomato paste. Broad beans, lentils and potatoes may also be added. The sauce, eggs, potatoes and meat are arranged around the dough dome. The dish is typically served with lemon and fresh or pickled (imsaiyar) chillies. The old way of making bazeen is to form the dough into palm-size cakes and cook in water in a special copper pot called a qidir. The barley cakes, having become solid, are then broken up in the pot with a large, flat, wooden ladle and mixed to form one large piece. Nowadays, a blender is often used, or the dough is cooked immediately in water like a pudding. ↑ "... and bazin, made of steamed wheat or barley and a sauce of stewed vegetables and meat." ↑ "Bazin is a Libyan speciality - hard, paste-like food made of water, salt and barley and is really not recommended except to the gastronomically hardy." ↑ "Pumpkins (Cucurbita pepo) grown in Libya are widely utilized as cooked vegetable served with tomato sauce with such national starchy dishes as 'KosKos' and "Bazin'." ↑ Rozario, P. (2004). Libya. Countries of the world. Gareth Stevens Pub. p. 40. ISBN 978-0-8368-3111-5. 1 2 Davidson, A.; Jaine, T.; Davidson, J.; Saberi, H. (2006). The Oxford Companion to Food. Oxford Companions. OUP Oxford. p. 1356. ISBN 978-0-19-101825-1. 1 2 3 4 5 6 7 Long, L.M. (2015). Ethnic American Food Today: A Cultural Encyclopedia. Ethnic American Food Today. Rowman & Littlefield Publishers. p. 376. ISBN 978-1-4422-2731-6. ↑ Grolier Educational Staff (1992). New Book of Knowledge 1992. Grolier. p. 188. ISBN 0717205231. ↑ McLachlan, Anne; McLachlan, Keith Stanley (1997). "Tunisia Handbook with Libya". Footprint Handbooks. p. 438. Retrieved 26 March 2016. 1 2 3 Blady, K. (2000). Jewish Communities in Exotic Places. Jason Aronson, Incorporated. p. 327. ISBN 978-1-4616-2908-5. ↑ "The Libyan Journal of Agriculture". Volume 4. Faculty of Agriculture, University of Alfateh. 1977. p. 199. Retrieved 26 March 2016. Wikimedia Commons has media related to Bazeen. Of “Bazeen” and Local Cuisine, Zainab Al-Arabi"